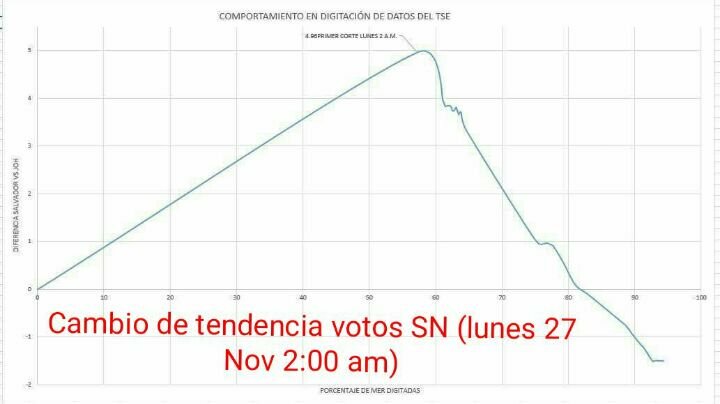 What happened to the democratic rights of the Hondurans who voted in the presidential elections on November 26th? The country is now in the hands of the armed forces. Human rights groups on the ground speak of murders, disappearances and many wounded as a result of the brutal repression at the hands of the police and the military. The first results published by the Electoral Court on Monday, November 27, gave a clear lead to opposition candidate Salvador Nasralla. Then a second count radically inverted this tendency, putting incumbent Juan Orlando Hernández as the victor. With protests of fraud, the court decided to suspend the final publication of the results. Both candidates called on their supporters to defend victory on the streets. But in the following days, Nasralla denounced that opposition protests were being infiltrated by outside elements, thus creating an image of a country in chaos. It was the perfect excuse for minister Jorge Ramón Hernández, who took no time in announcing the suspension of constitutional rights on Friday night, for a period of 10 days. However, as constitutional law experts have stressed, this decree could only be approved by the President in a cabinet meeting. As soon as the Electoral Court announced the vote swing favouring Juan Orlando Hernández, Nasralla announced that the elections were “being stolen” and that this time he would not allow it, referring to the 2013 elections in which he also ran, garnering 13% of the vote. Nasralla was then the candidate for the Anti-Corruption party that he had co-founded. In September 2014, the director of the Honduran Institute for Social Security was seized by the police for a theft estimated at 335 million dollars. The government of Juan Orlando Hernández declared that fighting corruption was to become a priority and signed agreements with several international organisations dedicated to transparency. 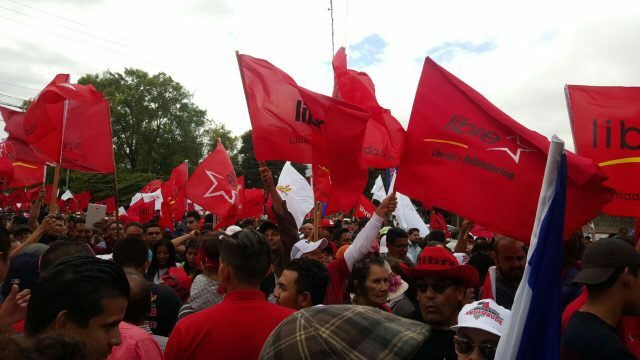 Meanwhile, the period after the 2009 coup has been extremely hard on Hondurans, who have valiantly resisted against the repression and the impunity of state agents. In 2015, the Honduran people marched every week with torches to protest against the dictatorship they faced, but the state carried on assassinating social leaders. The Honduran people have been subjected by the system to extreme violence, but there seem to be no alternative sight, as an opposition movement had yet to be unified. In early July 2017, after months of waiting and only a day before the deadline, the Electoral Court registered the candidacy from the Opposition Alliance Against the Dictatorship. 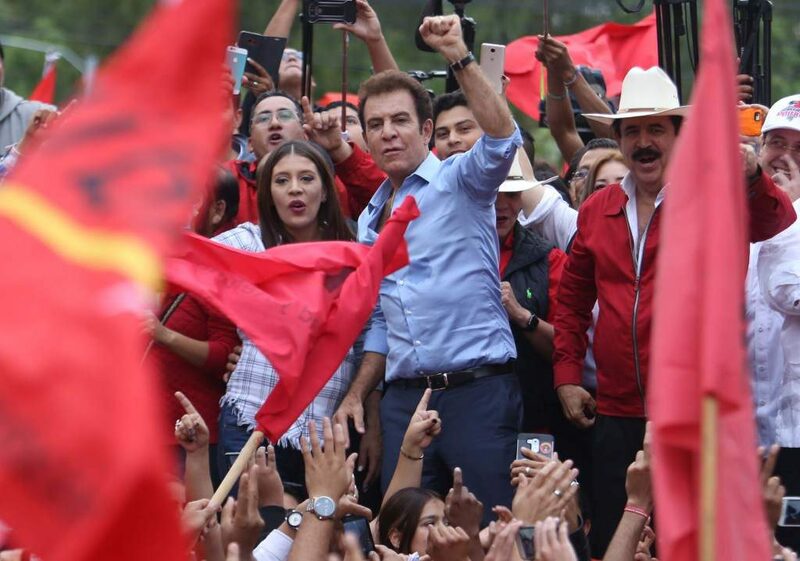 This coalition, coordinated by the ousted former president Manuel Zelaya, rallies multiple political forces around a social and democratic program: transparency and rooting out corruption; an alternative economic system with restructured productive sectors; investment in public services such as education, healthcare and housing; environmental protection, etc. In the elections inside the Anticorruption Party earlier this year, the party did not choose its co-founder Salvador Nasralla as general secretary. Then Nasralla became the candidate for the Opposition Alliance due to his popularity as a former sports journalist. Are democracy and impunity compatible? It is important to take into account the difficulty in mobilising voters in a country immersed in extreme, structural violence. Honduras is one of the most dangerous countries in the world. Its murder rate is only comparable to the situation of countries during wars, such as Iraq! In the run-up to the elections there has been an escalation of violence. In the weeks leading to the November 26 poll, activists from both Opposition Alliance and the governing party were attacked. The murder of activist Berta Cáceres in March 2015 became engraved in the minds of an entire generation. Since then, banners, murals and posters have multiplied to commemorate the courage she showed in her struggle against all odds. The slogan “Berta lives, she has multiplied” has spread beyond the borders of this small country. Berta had become renowned around the world for her role in the struggles of her organisation, COPINH. Her case is far from unique: for years, environmental activists have been harassed and attacked with impunity. In this context, the daughters of Cáceres, Laura and Bertha Zúñiga, quickly moved to the spotlight and denounced the responsibility of Juan Orlando Hernández’s government: “the oligarchic groups have great influence, they mobilize the army to repress people. We should point out that since the 2009 coup many military people have become shareholders in extractive industry projects (hydroelectric, mining, and others). But the corrupt mafias also allow for the organization of criminal groups that work in coordination with major corporations…”. Consequently Juan Orlando Hernández had every interest in hiding the incestuous links between the state and multinational corporations. It is no coincidence that during his term the security budget was increased and special military forces were created. The $17.3 million provided in security aid by the United States seem to pose no problem to our democracies. But the plot thickens: the president of the Constitutional Court, David Matamoros, is a relative of Dennis Matamoros Batson, a legal counsel of a company that provides services for DESA, the company accused of playing a role in the assassination of Berta Cáceres. One of the things at stake in the current Honduran elections is to get rid, once and for all, of this culture of political impunity. The Opposition Alliance had demanded total transparency in the special tallying process announced by the Electoral Court, and sent a letter detailing 11 necessary conditions for them to accept the result. But the Court did not respect these conditions, and the Alliance has called on people to defy the curfew and defend the victory stolen via electoral fraud. Nasralla has pointed the finger at president Juan Orlando Hernández and Electoral Court president David Matamoros as the ones responsible for the situation. It is true that elections are just a single moment in people’s lives. But in Central America, where institutions have done nothing to defend quality public services, representatives have destroyed whatever was left by raiding social security funds, there are crucial matters at stake. People would have plenty of reasons to adhere to fatalist ideas of “all politicians are the same”. If we add to this the trivialisation of violence and judicial impunity, we would believe that nothing could be done. But this is a vision that underestimates people. History has shown, in contrast, that resistance is necessary and inevitable. The day after the 2009 coup, in spite of their suffering, the Honduran people did not sit idly by. First it created a Resistance Front against the coup government. Then it focused efforts in the struggle against corruption and continuity, especially since Juan Orlando Hernández bypassed the law to run for re-election, something that is illegal under the current Constitution. Finally, it is equally important to emphasise that these movements have understood that struggles, in order to be effective, also should bring about a change of government, even if that is not the final goal. As such, they have formed an Opposition Alliance to take on the current political opponent, and not shying away from openly describing the government of Juan Orlando Hernández as a dictatorship. From Saturday, December 3rd, to Sunday, Hondurans again protested against electoral fraud, the curfew and repression by banging pots and pans. In this context, the announcement of new results by an Electoral Court which is suspected of colluding with the government offers no prospects of exiting this deep political and institutional crisis. Only adhering to the conditions demanded by the main opposition party and putting a stop to repression will do. In light of the challenges posed by Honduran events, the reactions from international bodies such as the OAS * (whose president Almagro is obsessed exclusively with Venezuela) and the media have been timid or non-existent. This shows that the big powers are more than comfortable with failed states so long as they help advance their geopolitical interests. The Honduran people are providing a brave lesson of hope for the oppressed peoples of the world. Let us join them in their struggle. After a tour in the United States, where there is a large number of exiled Hondurans, Nasralla met with OAS secretary Luis Almagro to present the documents in possession of the Opposition Alliance that demonstrated the large number of irregularities in the electoral process and demand that the elections be held again. Faced with the evidence of fraud, the OAS finally accepted this initiative on December 19. But everything suggests it did so imposing its own conditions: on December 10, the coordinator of the Opposition Alliance and deposed former president Manuel Zelaya had denounced pressure from the OAS with the goal of dividing his political alliance. 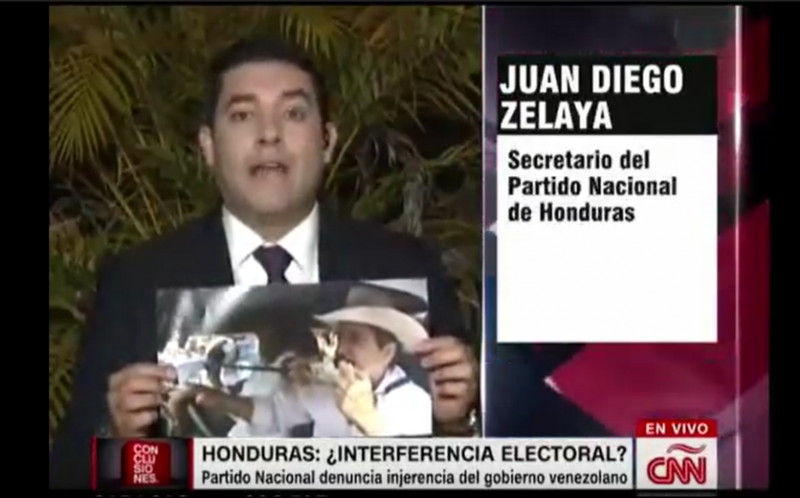 And effectively, on Friday December 22, shortly after the US State Department recognised the results announced by the Electoral Court, Salvador Nasralla gave in to this pressure, announcing that he was leaving the Alliance to start an initiative of national dialogue, with the goal of reaching other opposition forces that are against the fraud and the current situation in Honduras. 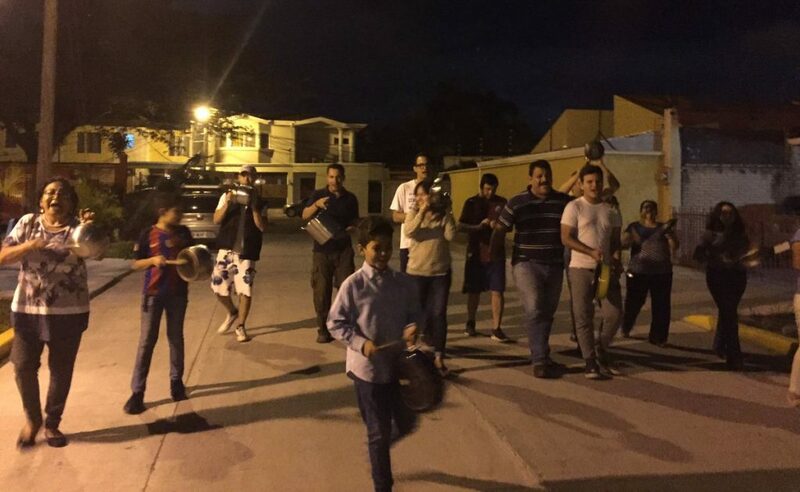 (1) The group Los Guaragaos became known by their rendition of Ali Primera’s “Casas de Cartón”, a song that denounces structural poverty in Latin America.